Excerpta Medica, EMBASE, Index Medicus/MEDLINE, Scopus. The Journal of Experimental Therapeutics and Oncology is devoted to the rapid publication of innovative preclinical investigations on therapeutic agents against cancer and pertinent findings of experimental and clinical oncology. 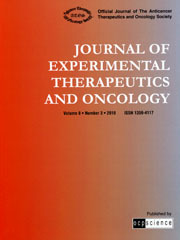 In the journal you will find review articles, original articles, and short communications on all areas of cancer research, including but not limited to preclinical experimental therapeutics; anticancer drug development; cancer biochemistry; biotechnology; carcinogenesis; cancer cytogenetics; clinical oncology; cytokine biology; epidemiology; molecular biology; pathology; pharmacology; tumor cell biology; and experimental oncology. Papers concerning work on humans must comply with the principles of the Declaration of Helsinki (1964). The approval of an ethical committee must then be stated on the manuscript. The editors reserve the right to reject a paper with questionable ethical justification.